Each woman initially attends the Downton Abbey screenings in an effort to escape the stress each is experiencing in her own respective life. Samantha is struggling with trying to sort out and understand her true emotions for a rich man she married at a young age to pull her and her siblings out of poverty. Aspiring author Claire is faced with writer's block as she copes with being alone for the first time in years when her only daughter goes away to college. Meanwhile, divorced and single-mom Brooke is constantly battling with her condescending ex-husband over money and his role in their daughters' lives. Throughout the novel, the trio of women develop doting and healthy relationships with one another and help each other out in unique ways that eventually pull them out of their slumps. Edward also plays a role in opening each woman's eyes to new possibilities and a fresh start in life, thanks to his elite skills as a quality and caring concierge. You won't be required to have watched Downton Abbey to enjoy this book, though being familiar with the series will highly magnify your appreciation for this novel. It goes without saying that those of you who actually watch the series will love While We Were Watching Downton Abbey, while those of you who haven't seen the British period series will probably want to dive in as soon as possible after reading this book. Putting the Downton Abbey aspect aside, what I REALLY loved about this novel was how each woman started out in a difficult place, yet managed to pull themselves out of their dark places with the help of some very loving and encouraging friends. I'm often bothered by society's impression of how life is considered over after you either lose hold of your career, get divorced, have children, grow older, etc., thinking that these scenarios are always impossible to overcome. So naturally, I really enjoyed reading about how these perfectly imperfect women made it through rough times intact and better off after developing a solid and healthy support team. I finished While We Were Watching Downton Abbey a few months ago, but the novel continues to stick in my mind, which is always a sign of a great book. Although it's safe to say that the outcome for all characters is predictably positive, the journey is more than pleasing, and well worth your time. 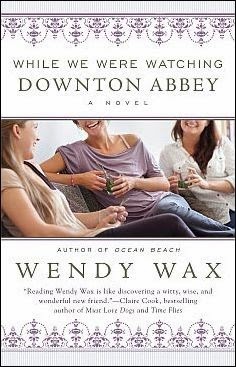 Wendy Wax is also the author of The House on Mermaid Point, Ocean Beach, Ten Beach Road, and Magnolia Wednesdays.